The dreams started on Tuesday. I’m climbing the stairs to the third floor of the main building. I can’t tell if I’m sweating because of nerves or simply because there’s still no air conditioning. I can’t catch my breath. 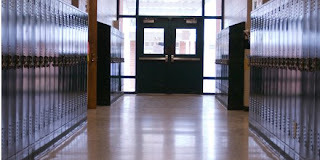 The floor slopes strangely as I race down the hall, my eyes scanning quickly along the numbers ticking across the wall. I have no idea which locker is mine, much less what combination will tumble the lock into place so I can retrieve my books. And there are so many books. I don’t know where they came from, but I find myself carrying enough textbooks to crush an average 9th grader. They’re not my books, not my locker, and no one is listening. Suddenly I’m in a different hall, different building, but just as lost. Where the hell is Mr. Saunders’ calculus class? And why is it always calculus that I can’t find? I keep checking my schedule, printed on carbon paper from the guidance office. Every time I look at it, there are new classes, new room numbers typing across the page. Wandering into the back of the nearest classroom, I discover that I’m in biology. Lab day. I haven’t studied. It’s not my best subject. The teacher looks angry. I try to blend into an empty desk, hope that she won’t call on me. I have no idea what is going on or how to get out. I should probably be glad that I never have the dream where I show up naked at school. Or maybe I should just put on my big girl pants and get over the fact that my 20th high school reunion is this weekend. Crap. My name is Suzanne, and I author the blog pretty*swell. I’m so grateful for Cyndi sharing her space today for a cause close to my heart. 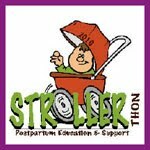 The StrollerThon, benefiting Postpartum Education and Support, is this Saturday in Apex, N.C. If you live nearby, it’s not too late to register! We’re also hosting an online raffle of a beautiful Bumbleride stroller. Tickets are only $5, and you don’t need to be present to win. Proceeds from the raffle and event will allow our organization to keep helping moms beat perinatal mood disorders like postpartum depression and anxiety. I had my breakdown about a year ago. It was a Monday morning, still very clear in my mind, and I was eight weeks postpartum with my second child. My son was sick, again, and I was crying so hard I could barely text my mom to have her come over immediately. I waited anxiously at the door with a screaming, ill child and greeted her by handing over my son, saying, "I can’t do this anymore." She had me call my doctor that morning, and I can’t thank her enough for starting me on the road to accepting and recovering from PPD. The anxiety and depression were both new to me, and I only experienced mild baby blues with my daughter. My son, N, was a huge Christmas morning surprise to my husband and me (two pink lines? What? ), and nine months later my cute little boy was born, unaware of the challenges that awaited him. He had a very bumpy first three months and was sick often: N had everything from harlequin color change to dairy intolerance. All of this weighed me down, spending countless hours at doctor appointments, pharmacies and "researching" on the internet. I was overwhelmed. I felt guilty, exhausted, constantly sick to my stomach, and I cried many, many times a day. I didn’t want to show any sign of weakness. My anxiety came in the form of the clock; it was my worst enemy. I would time N’s feedings with a stopwatch, starting the timer before getting him latched on just to add a few extra seconds. I couldn’t help myself, and I knew it was silly, but it’s just what I HAD to do. I had alarms on when to feed him, when to wake him, when I should wake, when I should sleep, and I was basically driving myself over the edge. I didn’t sleep much, and the insomnia was becoming dangerous: I vividly remember driving alone one night and seriously considering crashing my car just so I could get some rest in a hospital. My depression surfaced during those long, lonely hours at night. I dreaded the sun going down, because I felt so ALONE, and was I left with my fears and guilt. My husband was fantastic and caring, my parents were helpful, but I just couldn’t shake the darkness that enveloped my life. I felt like I was living in a deep black hole and struggling not to sink deeper. I was scared to be alone with both children, scared to leave the house, and scared to admit that I needed help and wasn’t as strong as I thought. Through an online moms forum, I read about Moms Supporting Moms and was willing to give it a chance. After sobbing my way through my introduction and hearing others talk, I felt so comforted knowing that I wasn’t crazy and that there were moms there that *got* my feelings of guilt, anxiety and depression. If it weren’t for the caring and understanding moms I met through Moms Supporting Moms, along with my wonderful family, I wouldn’t have been able to heal like I have. It’s been a long road, but light and happiness now fill my life, and I say yes, I can beat PPD. Note from Cyndi: Thanks to Suzanne and Jodi for their work in support of moms in need! Please check out the links above and help in whatever way you can. The first time I went to an Eddie from Ohio show and heard lead singer Julie Murphy Wells belt out the band's a capella "Great Day," I leaned over to my date and whispered that the song would make a perfect wedding processional. Less than a year later, I married that date -- and although we didn't play the song during our wedding ceremony, we did use it to make our grand entrance into the reception. Even with the red eye, this is one of my favorite wedding pictures. A candid photo from a friend, it captures how very happy we were in the moment. When our friend and emcee DSR introduced us as the song rang out through the room, it truly was a Great Day -- what a blessing to be together and to have so many wonderful friends and family there to celebrate with us. And so today, on this Great Day ten years later, with blue skies, green grass and beauty surrounding us, I am counting my blessings. A lot has changed in the past decade -- and not all of the 3,650 days were easy ones -- but every day together will always be a Great Day. All I could think about in that moment was getting home. As fast as possible. I'd been sitting in my Tuesday morning graphic design class in the basement of Carroll Hall when some journalism student ran past shouting something about a plane crashing into the World Trade Center. Silly undergrads, I thought. Those kids will do anything for attention. And then I could hear the news coverage suddenly playing live on the big screen in the classroom next door. Not a joke at all. Not even close. A quick check of my email showed a message from my almost-husband sending me to CNN's website, but by the time I clicked the link the internet had screeched to a halt along with the rest of the watching nation. Home. If I can just get home, I said to myself, I'll be okay. As classes ended abruptly across campus, I stepped outside into the bright blue day and called P to come get me. I didn't think I could walk the mile back to our house. Looking back on that moment, I'm struck by how many people just wanted to be home at that same instant and weren't able to call someone to come get get them. How many people were waiting by the phone to get that call, but it didn't ring. P and I spent the rest of that day hugging each other and watching the news and cleaning our house, as if eliminating the dust bunnies from our hardwood floors would somehow eliminate the threat of terrorism in our country. 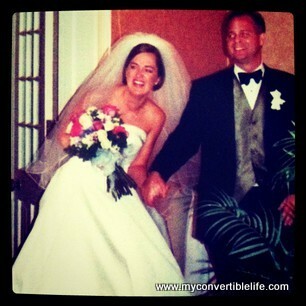 Then four days later, we got married. It's a strange thing to share the week of my wedding anniversary with a day of national terror and destruction. But it's also a powerful reminder of how blessed and lucky I am to have been able to call my true love that day and have him scoop me up and take me safely home. Sending prayers for all those who are missing loved ones from their homes today. We've taken our kids to the beach for a week every September (or late August) since they were born -- Junius was only 2 months old on his first trip, while Pippi (a winter baby) was already 6 months. We're beach people -- it's what we do. Over the past six years, I've picked up a few tips to make parenting at the beach a little easier. Of course, things change with each stage -- thankfully I no longer have to worry about my kids eating sand and shells. Trash bag: Bring a plastic grocery bag down to the beach with you every time you go. You can use it to collect trash (for my kids, it's juice boxes and fruit snack wrappers and banana peels) so that you don't accidentally litter on the beach. When you come inside, just drop it in your trash can. It's not fancy, but it helps. Jumpster: This bit of strategery (courtesy of my friend D) doesn't work so well if it's really windy on the beach (ahem, not that we learned this the hard way or anything, but you really don't want the tent to blow away in a strong gust). But if you've got an infant who likes bouncing in the jumpster, consider bringing it down to the beach and hanging it from your tent poles. It'll keep your baby entertained and away from all that tempting sand. And if your baby doesn't like it, use it as a handy place to keep snacks out of the sand and easy to reach. 3-in-1 wash: One of the hardest things about being at the beach with little kids is getting them sand-free when it's time to come in. I like to keep a bottle of 3-in-1 wash (shampoo, conditioner and body wash) at the outside shower/hose. Soaping them up all over makes it easier to slide the sand (and most of the sunscreen) off of their crunchy, sticky little bodies. And by washing them outside, it keeps more of the sand out of the house. Burrito lunch: Now that my kids are old enough to go all day without a nap (and with a deliciously easy, early bedtime), we had lunch on the beach. But no matter what I tried, their turkey or almond-butter-and-jelly sandwiches always looked sandy and crunchy. Then I made burritos for dinner one night and wrapped the leftovers in foil. Voila -- the perfect leftovers for a beach lunch because you keep your sandy hands on the foil and just unwrap as you go. Would work with sandwich wraps as well. Plastic pool: Last year I showed you how to build your own pool right in the sand. But this year our friends S&J brought one of those hard plastic pools with them. The pool served many important purposes during the week: a fun splash area for the kids to play in; a storage container to corral all the shovels, buckets and toys at the end of each day; and (most impressively) an aquarium space for the live marine animals that J found in the surf. Yes, that's a giant clam arm-foot-tongue thingy twisting out of its shell in that photo. Your turn to share -- what are you must-do, must-have tips for parents with kids at the beach? As my friend Julie at Simplify Your Life will tell you, every mom (or dad) needs a packing list for the beach. Not one that you scribble on post-it notes the night before your trip, but a real organized list that you save and use every year. And if you go back to the same rental house each time, you know what to expect and what you need to bring. After polling our beach friends, I think the most important thing we could add to the list would be an afternoon chef who would prepare dinner each night and bring it out to the beach for us so that we don't have to go inside until dark. And a waiter, to bring us drinks and fresh juice boxes. Kitchen knives: The knives at our house are terrible. It's a wonder I haven't lost a finger tip just trying to make a straight cut through an apple. Packing a good paring knife and one big cooking knife would make me much happier and wouldn't take up much space in the luggage. Nice pan: For my friend D, it would be her all-clad pans. For me, it's my Scanpan (thanks, Mom!). Whether I'm trying to make grilled cheese sandwiches or a vegetable stir-fry, the crappy, peeling pans at our house are a mess. Again, one pan won't take up much room and would make a more successful dinner. Small table: Okay, so this one might not seem as easy to pack -- but a small folding one should work. And it would be so lovely to have somewhere to set your mai tai when you're on the beach so that your glass doesn't accidentally get knocked over in the sand (the horror!). Clothesline with pins: No, it's not glamorous. But when your wardrobe revolves around three items (a dry swim suit, a wet swim suit and pajamas), you really need to be sure those suits get dry quickly. Hanging things off the rail or the deck chairs will suffice, but it gets to be a mess. Rechargeable batteries: Our digital camera burns through batteries at a breakneck pace when we're at the beach (perhaps because we take literally hundreds of photos). Bringing a charger and batteries would make me feel much more environmentally friendly while I let Pippi wander around taking photos of her feet. What important items are on your beach packing list each year? After washingdryingputtingaway five loads of laundry, unloading the dishwasher, unpacking most of four suitcases and countless bags, clearing the answering machine and sifting through a week's worth of junk mail, we're all back to work and school again. But having just spent a blissful six-and-a-half days at the beach, I guess I really shouldn't complain. 1. Beautiful weather: Hurricane Irene threatened to ruin everything, but ultimately made landfall north and east of our beach. As it turned out, we had perfectly sunny skies for seven straight days and no significant damage left behind. Not sure if we were blessed or lucky or both, but I'll take it. 2. Family photos: This year I took 734 pictures over the course of our beach week (although some of those were Pippi running off with the camera). That's not counting all the photos of us taken by friends or the pictures my husband took on his phone. It sounds excessive, but I love having the time to capture my children (and my husband) in their element. And this year a talented new friend with a fancy camera took some extra photos of us that are just beautiful. 3. Date night: Another friend at the beach voluntarily came over to our house after the kids went to bed so that my husband and I could have a date night. As in, just the two of us on our own all by ourselves at our favorite beach restaurant after dark. As in, hasn't happened in more than six years. What a treat! 4. Play time: Our kids are never happier than when they're at the beach. They get to be free all day, eat fruit snacks and chips non-stop, drink juice boxes until they pee in the ocean, get sandy dirty, run wild with their friends -- and no one tells them to "be quiet sit still don't touch that wipe your face" for most of an entire week. Plus we're the beneficiaries of great friends who have a combined eight children for them to run around with -- and parents who do cool things like fishing, egg tosses, corn hole, beach yoga and sea life pools. It's kid heaven. 5. Time with friends: In you case you hadn't noticed the theme, a big part of what makes our beach week so special is the families who have joined us for six years now. We met by accident, but have remained friends by very conscious choice (and careful planning) -- their friendship is truly a gift. In addition to the fact that they and their children help entertain our children (which is blessing enough), they are kind, funny, intelligent, curious, interesting people who will talk and read and laugh and make mai tais and just plain sit on the beach until dark. Thank you for these simple, wonderful gifts. Only 354 days until we'll be together again in the sand. Don't steal what you find here. If you see something you like, then ask. Nicely. This entire blog is (c)My Convertible Life(tm), since 2009.